News of council planning hold ups dog the new 'Northbridge Brewing Company', as revised plans tried to sidestep disabled access laws by renaming an upstairs trading area. Clearview Investments Group, who were given the green light on planning in January, have a hit a stumbling block by omitting an elevator fromplans, providing disabled access to a top floor alfresco area (they basically changed the name from a 'skydeck al fresco function room' to the 'skydeck al fresco area'), hence falling foul of Western Australia's disability laws. A bit of cost cutting that will surely have to go back to the drawing board. Hopefully there won't be any cost cutting when it comes to the brews, as former Old Swan brewer and local brewing identity Hugh Dunn oversees operations. And as speculated in this blog back in October last year, Why has Chuck Hahn been spending so much time in Perth? Well, I'm simply putting two and two together, but Chuck recently intimated in a chat with UK beer writer Roger Protz that Perth was on the radar for a James Squire Brewhouse. If you have visited the Sydney incarnation at King St Wharf, then you know that the format works particularly well on the water - and this is where the other part of the maths comes in. Back in June 08 Perth City Council approved plans for an enviromentally friendly timber built micro-brewery, function room, restaurant & supper club, as part of the newly redeveloped parkland at Point Fraser, close to Heirisson Island and the Burswood casino complex. On the banks of the Swan River, the new site is hoped to be open some time later this year or early 2010 - and i'll bet my bottom dollar that the 'James Squire' signs will be hanging over the door! Quick Price Survey - How does Perth stack up on beer prices? We often complain about the price of beer here in Perth. Some blame the government, others the lack of Pokie revenue, hell, some of you may even blame the greedy licensees! Well here is a snap poll on current pricing on two of the worlds uber brands, Heineken & Corona, by no means my first choices out of the party esky, but definitely two beers available the world over. Beer & Chocolate matching this Easter? Why not do it on a budget? With Easter ‘the festival of chocolate’ just days away, I thought it would be a good time to delve into the hedonistic past time of Beer & Chocolate matching. I have been advocating the virtue of beer’s rightful place on the dining table for some years now, and often talk on our tours about the joy to be had when pairing a luscious chocolate cake with the intense and complex flavours of a stout. To those of you in the know, having a bottle of stout handy for dessert time is no revelation. However for some the sheer notion of matching the two up is inconceivable. No doubt those naysayers follow the popular belief that red wine is the natural partner for chocolate. This is quite a well touted idea, and although I’m not saying there aren’t any good red wine/choc combos to be had, the fact is that the flavours of most wines are overwhelmed by the richness of chocolate. Beer on the other hand offers a different proposition. ‘Chocolaty’; ‘Bitter’; ‘Roasted’; ‘Earthy’ ‘Toasted’; ‘Coffee’; ‘Toffee’ are all flavour and aroma characteristics that can be attributed to beer and chocolate alike. So we’re already off to a good start. Beer also provides the necessary carbonation to cleanse the palate and a certain robustness and richness that can only be delivered by grain, not grape. When aiming for that perfect match you are looking for the beer to complement the chocolate flavours and mouthfeel, without being overwhelmed by it’s sweetness. It’s about trying to elevate the flavour experience to beyond that of the individual products. Now I’ve just realized how that last paragraph actually sounds, and I fear that I am treading dangerously close to “wanky” wine territory. Our boutique beer tours try to promote a more informed appreciation of beer selection and enjoyment, without taking the whole tasting process too seriously, so I do cringe a little when I err towards the language of the wine critic. Following a few simple guidelines should get you on the right track to an enlightened tasting experience without the need for a thesaurus or spittoon. Dark Lagers; Dunkels; Heavier Ales; Stouts & Porters all fall into this category. 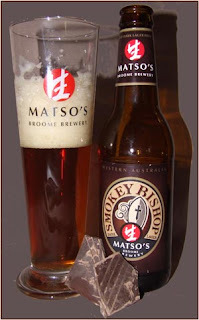 The roasted malts are what give these beers their dark rich colours and complex deep flavours. The ever present roasted, toasted, coffee flavours of these beers blend beautifully with the similar notes present in many dark & milk chocolates. Predominantly the white beers styled on those of Belgium & Germany, where wheat dominates the grain bill and also some Belgian style ales feature here. These beer styles offer up some classic fruity and spicy dessert flavours (think Citrus; Banana; Clove; Nutmeg; Apple; Peach; Cinnamon; Apricot) that can really heighten the flavour of chocolate, particularly white chocolate. Coopers Pale Ale; Golden Ales; American Wheat Ales; Kolsch; Blond Beer , this is a pretty broad category. Lighter and a little sweet in style, these beers pair well with products like chocolate chip cookies where there is lower chocolate concentration, and in the case of cookies, the sweet biscuitiness (if that’s a word?!) complements the beer further. Finally, and kind of out there on their own, these sour Lambic styles, Kriek (Cherry) and Framboise (Raspberry) are a perfect off set to rich dark chocolate, with the tartness of the fruit combining deliciously with the bitter sweet chocolate. Keeping all of this in mind I set out to hold a little Beer & Chocolate experience of my own. However, not wanting to follow the well travelled path of ‘gourmet’ Belgian chocolates and swanky imported liquid gold, and moreover not having the budget amidst the GFC, I decided to try and complete the exercise on a budget. By ‘on a budget’ I mean using up the oodles of ‘brand name’chocolate bars that have somehow steadily multiplied in our cupboards since last Easter. As for the beers to match, I picked up a mixed bag of styles (I didn’t want to just stick to the obvious choices) all at reasonable price points from a local, non-specialist, bottle shop. So they should be easy to get hold of if you wanted to have a go yourself. TIP: Like with many ales, allowing the chocolate to warm in your mouth a little will help to release some of the volatile flavours. Here’s my results, so why not go and have a bit of an experiment of your own? Brewed with barley and wheat malts with the addition of amber honey, this beer presents as fresh and crisp with dominant honey notes. The slightly bland finish of the beer is lifted excellently by the caramel sweetness at the end of the Picnic. Whilst the honey sweetness of the beer combines well with the light malt & nuttiness of the Picnic. 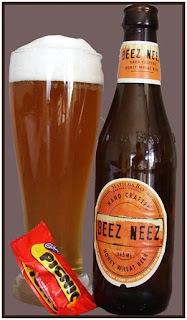 It’s almost as if the ‘beeriness’ is enhanced of this clean and refreshing Beez Neez. Note: Also tried with Crunchie – no good, choc was overly sweet and drowned out most of the beer characteristics. Brewed as a crystal wheat beer based on a Belgian Witbier, I thought the gentle carbonation and slight citrusy notes of the beer likened it to a Kolsch. Paired with the sweet, highly caramel taste of the white chocolate , the initial combination delivers a zesty lemon hit from the beer, before combining to an almost Ginger climax. The residual flavours are gentle and sweet with caramel and honey remaining. I tried the Porter against a few of the heavier weight Lindt chocolates that I was convinced would be a perfect match, but found that against the high percentage cocoa content that it only just stood up to the intense bitterness levels, undoubtedly it mellowed the bitterness, but didn't really take me to a higher plain. Surprisingly the winner for me with the Porter was the good old fashioned Kit Kat! The residual sweetness of the chocolate balanced out sensationally with the bitterness of the Porter with some shared malt flavours also coming to the fore. The versatile Kit Kat also performed well with light quaffing Gage Roads Wahoo. Initially the combo raises the beer profile to a fruitier sweeter high than when experienced alone and that holds as the milk chocolaty flavours remain. The sweet maltiness of the biscuit inside balances well with the sweetish Munich & Vienna malts present in the beer. I found this dark lager to have a bittersweet aroma, a very subtle chocolate flavour with a hint of coffee, and quite a pleasant medium bitterness. This was matched up with a Lindt Coffee Chocolate, this is a pretty good quality chocolate with medium to high bitterness, a very subtle coffee presence throughout and a smooth bitter finish. An excellent combination with contrasting and complementary flavours melding together to deliver a nutty mocha taste sensation. This pale, complex and fruity lager is one of my fav’s at the moment. Wonderful floral aromas with a high hop bitterness that lingers at the finish. The pairing met wonderfully in the middle, the spiciness of the hop character cut through the increasing sweetness of the chocolate and coconut. This beer also worked well with the Terry’s Chocolate Orange delivering a spicy orange amalgamation, that reduced the ‘milkiness’ of the chocolate so that it tasted like a dark chocolate. The cask version of this beer won the Champion Beer of Britain back in 2003, and its probably been longer since I last purchased any. Herbal & Hoppy, refreshing and dry, it reminded me of the Moorish quality of British cask ales, when ‘just popping out for a quick pint’ could easily degenerate to consuming a gallon. The combination with this chocolate finds the orange essence dominating, masking any sweetness of the beer, it’s any interesting spicy orange combination, not unpleasant, but not good enough to stop you from drinking the beer ‘un-paired’. A meeting of old classics with a nice balance of sweet & bitter between these two. Both finished at different bitterness levels, quite high coffee and alcohol flavour from the stout, certain dark roasted malt appeal. Quite adult flavours. Fruit & Nut – Hoppiness of the beer complements the toasted nut and the sweetness of sultana. Chocolate Orange – Spiciness of the beer is brought to the fore. Ginger Snap – Nice combo, spicy and peppery. Lindt Chilli Dark Chocolate – Nice contrast, spice & chilli meet, whilst the beer’s bitter finish cuts through the sweet chocolate. Get the latest word on the streets with our beery Twitter Tweets! Find your way to the Perth Bottlo's that really care about beer . . . In Need of Some Air! Tuber Babies, Human Sacrifice and Harvest Home.